A Year of FHE: FREE DOWNLOAD // Light The World Fill-In Picture for Kids! 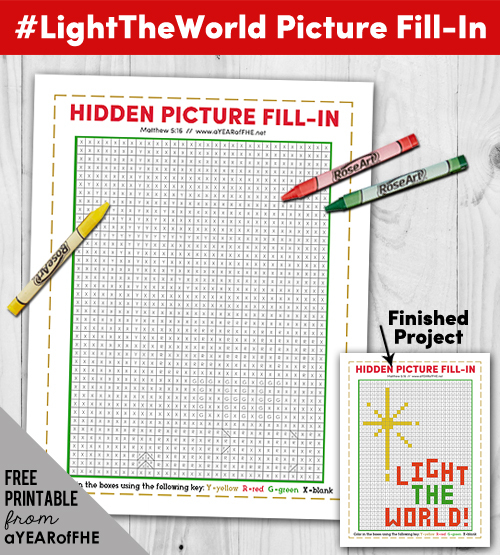 FREE DOWNLOAD // Light The World Fill-In Picture for Kids! This December I haven't been able to share as many activites for Light The World as I would like sonce our Internet is down. Booooo! I thing I have it fixed now so I am so excited to get to share this fun Fill-In Picture Activity download with you! Kids just need a red, green, and yellow crayon and they will be occupied for a while with this fill-in activity! If your Ward/Branch is having church services on the 24th this would be a great quiet activity for Sacrament Meeting. Click the green download button below to print yours today! Feel free to share and photocopy for your friends and family, but please don't share any other link than the one on this post for others to download!